Sometimes it is very easy to get lost among the abundance of applications that supposedly want to improve your web browsing experience. When your head is spinning from the entire variety, it is easy to miss the likes of Weather Do, when they enter your computer. This application is an adware program, and as such it enters target computers having only financial profits in mind. Luckily, the application cannot log your key strokes and steal your credit card information, but there are other specific things that make use wary of the program. The bottom line is that it would be for the best to remove Weather Do from your system if you want to secure it against dangerous intruders and potential malicious exploitation. One of the hardest things about adware is that sometimes it might be difficult to differentiate between a potential threat and reliable application. For instance, if you were to access weatherdo.com (the official website for Weather Do), you would think that the application is very useful, as it can give you information on the latest weather updates in your region. However, if it were such a decent program, it would be installed on almost any computer out there, and that is certainly not the case. So what is exactly wrong with this application? The problem is that the official website is hardly the main source of distribution. It is far more likely that users download this program bundled with other freeware. For example, if you are looking for a file converter or a media player, and you are provided links to file-sharing websites, you should think twice before clicking the download button because third party websites often promote installers that contain more than just one application within. Thus, you might have installed Weather Do accidentally when you downloaded some other program. All it takes is skipping through installation steps for adware to settle on your computer. Alright, you may not have planned to have this application, but there is no harm in keeping a weather app, is it? Well, we could not agree on this 100%. The point is that the functionality of the application is highly questionable. When you launch the app, it opens yet another window with various social and commercial offers. 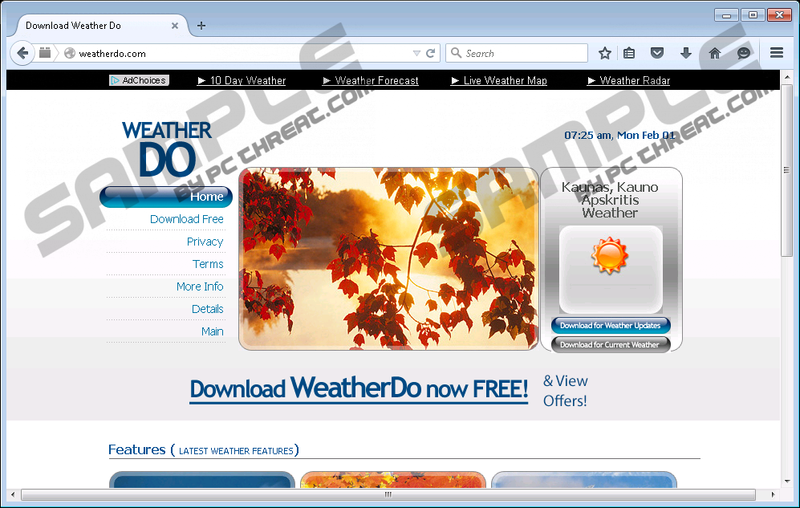 For instance, Weather Do is known to load legitimate weather websites like wunderground.com. The question is then, why do you need a third-party application, if it makes use of well-established weather channels? It is highly inconvenient and definitely unnecessary. If that were not enough, Weather Do could also be exploited by cyber criminals to display their corrupted content. Since the application promotes third-party links and the like, there is a possibility that the ads displayed by the app could be embedded with outgoing links that lead to dangerous websites. There is nothing we can do to stop Weather Do from promoting unreliable content. The application is not responsible for third-party content security, and it basically washes its hands off whatever may happen to you if you were to access a malware-related page. To make matters worse, we also believe that Weather Do is not the only unwanted application on your computer. Even if you download the program from the official website, the official installer bundles the application with a number of potentially unwanted applications and even browser hijackers. Depending on your region, you may also have Search Know, sweet-page.com, yoursearching.com, MyPCBackUp, and other undesirable applications on-board. Needless to say, you should not tolerate them any longer. You need to remove all of them together with Weather Do. As far as the removal of this adware application is concerned, there is nothing complicated about. The program can be uninstalled via Control Panel, and all the files and registry entries will be eliminated automatically. You will not have to terminate any additional files on your own. However, it would be a good idea to scan your PC with the SpyHunter free scanner when you are done with the manual removal. As mentioned, there could be more programs that need to be removed from your system, and you also have to be sure that you have deleted all the potential threats. Finally, a legitimate computer security tool of your choice will help you protect your PC from potential threats, and consequently, this way you would avoid computer crashes, identity thefts, and financial frauds. Type Control Panel into the Open box and click OK.
Go to Uninstall a program and remove the application. Select Uninstall a program and remove the application. Access Add or remove programs and uninstall the application. Quick & tested solution for Weather Do removal.